Holidays are wonderful (although the build-up isn’t always so great!). I love spending time with my family, travelling to new places and learning, yes, I said learning about new things. I didn’t grow up thinking that holidays were just about relaxing. Instead they were exciting, full of anything from castles and museums to lakes and mountains. We went fishing with little nets in Devon and to the magnificent Cologne Cathedral in Germany. We learnt about steering a canal boat and opening locks in Wales, and visited historic chateaux in the Loire Valley in France. Holiday time was incredibly enriching. Of course we weren’t on the go all the time. My parents were careful to make sure that we had lots of time to read, or swim or just chill. But we didn’t do that all the time. And, when I stop to think about it, the holidays I had as a child and loved, are similar to the ones we now have with our children. We travel somewhere and we shop and eat and have fun, but we also discover local museums (like At Science in Bristol, which was fantastic) and stately homes. Sometimes we learn in different ways too – by picking up bits of a different language if we go abroad, looking at maps of where we are travelling to, or even by one-offs. The children simply loved their trip to the Harry Potter studio tour and learnt an awful lot about how films are made. Meanwhile I will always remember the thrill of Jessica realising she could actually cycle properly as she went round and round the very safe caravan park we were visiting in France some years ago. It was perfect for building up her confidence. Of course holidays are all about trying new experiences. My son was thrilled to try out bungee jumping on a Bristol street, while my daughter loved swimming in the caves in Jamaica. We all enjoyed feeding the animals in Ireland (you can see this in the photo at the top of this piece and I think it was probably the first time that Robert, then only 2, had ever done it) as well as something completely different – the theme park rides in the USA. This is where my son discovered that he doesn’t appear to feel G force! So, holidays are fun, but they can also be so much more than that. Kids (and adults) can always learn and holidays, when you are relaxed and actually have some time to spend together, can be brilliant learning experiences. I, for one, wish we had more of them. Do you learn on holiday, and if so, what? 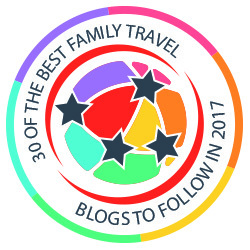 This post is part of the Visit Wales #Wales4Kids Family Holiday Challenge. Wales is the perfect place for a fun-filled family break. Share many of your childhood trips and think it is a real gift if your parents take you out and about. Makes it easier for us to help our children relax and learn on holidays if it was done for us. Lovely to read this post. Commenting for myself and on behalf of BritMums and thanking you for taking part. Thank you for your comment Kate! Lovely of you to stop by. I think we always learn something on holiday, even if we don’t realise it at the time. I’m working on my post for this Linky too! Look forward to reading it – and yes, I think you’re right. You don’t always even know you’re learning! At Bristol is great I love the planetarium there – very educational. I love Bristol the Waterfront area is lovely in the summer. Also would love to go to the Warner Bros studios. My favourite place is Wales though, you can’t beat Tenby! We’ve never been to Tenby. I think we should probably rectify this soon! Definitely go to the Warner Bros exhibit. It’s a must see! I’ve never had a holiday that was all about relaxing by the pool – you can do that at home (not in weather that good but it’s almost the same!) we’ve always been to museums and attractions! Yes, I think a holiday has to be a balance (though I can’t say I do much relaxing by the pool at home!) Thank you for your comment Hayley! Holidays are so important for cementing memories. When I think of my own childhood, it’s the trips we had which come to mind. They stand out when other events are blurred. I hope my son will remember his childhood in the same way. Look forward to reading it Trish – and yes, I think you always remember holidays.